Nonetheless this beautiful car with the nasty bite is still used in classic car rallies by a limited number of fans. Here you see a recent picture of a 300 SL Coupé in custom rally trim still being used in competition up to this day. No mean feat mind you, because the value of a 300 SL Coupé in good shape can be sky-high and the cost of parts is extreme, if you can find them. If you'd crash a car like this these days you have a very costly problem. In 1956 Mercedes charged about twice as much for a 300 SL Coupé as for a 190 SL convertible (its smaller sister) and for the same money you could buy 7 contemporary Volkswagen Beetles. This gives you an idea of how exotic this car was. 1957 saw the last Gullwing Coupés being produced. From the start of its production most of these cars were sold in the USA, simply because there were the most people who could afford it. Europe was still recovering from the second World War in the fifties, rebuilding all that had been damaged and that left little room for frivolous expenditures like the 300 SL represented. The US customers however felt that its cockpit resembled a hothouse, mainly because there was very little ventilation (only the little triangular windows next to the doors could be opened a bit). And since the wealthiest US-customers lived in warm and sunny states like Florida and California this was a serious sales disadvantage for the car. 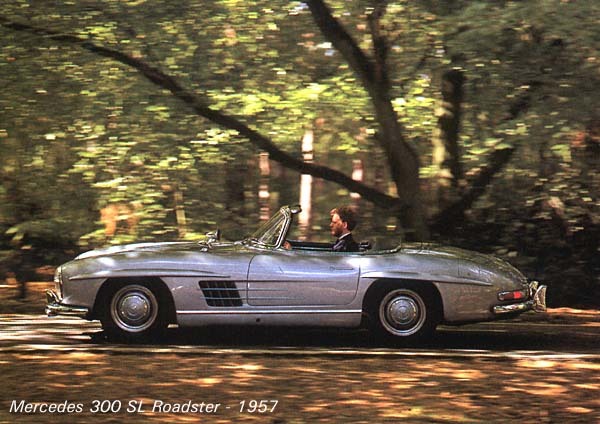 To make the 300 SL not too much of a burden on Mercedes-Benz's financial situation (it was never intended as a profit-maker), something had to be done. As you see in the picture the cabin of the 300 SL Coupé had to function as a luggage compartment too, that's because a spare wheel and a huge petrol tank took up all the room in the small trunk. 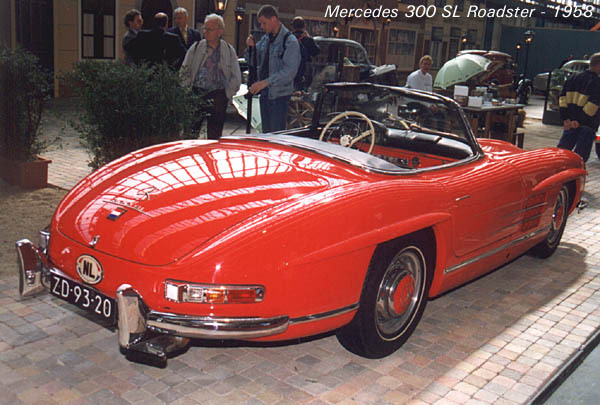 The 300 SL Coupé has been produced in the nice round number of 1400 units between 1954 and 1957. Since it was an instant classic most of them have been pampered and well maintained, so many are still around today. All the same only about 7% of the 300 SL Coupés still in existence are in true mint condition, and those cars fetch prices up to ten times the original purchase price, that's about the same as you would pay for a new Ferrari. Most available cars are in good to reasonable condition and somewhat more affordable at about 2/3rds to half the price of a mint one. Only 14% of the remaining cars are in lousy to desolate condition and oddly enough the value of 300 SL Coupés in this condition is rising. The explanation of this is that there is enough interest in these cars to make restoration profitable, and when done right restored cars can fetch a price close to that of mint ones. This leaves enough of a margin to motivate mainly German classic car traders to track and buy up 300 SL Coupés in poor state, restore them and sell them for exorbitant prices. 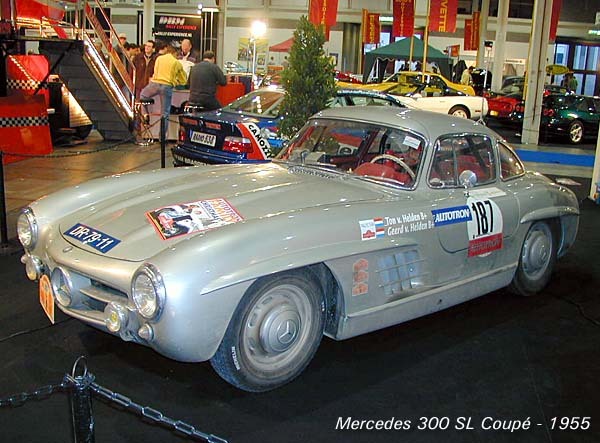 In 1957 Mercedes-Benz had to reinvent the 300 SL roadcar to stop loosing too much money with it. 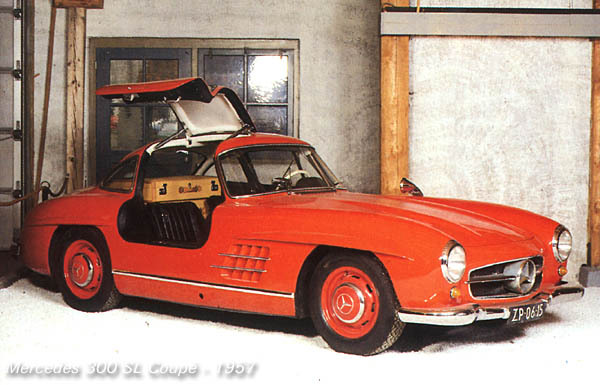 And the company came up with the 300 SL Roadster: a drop-top version of the coupé with regular doors. It was in essence the same car, but it lost its true racing character in favor of more driveability and practicality. In a way it seemed that the 300 SL Roadster had derived from the 190 SL (1955-1963, nicknamed the "boulevard car") rather than from the 300 SLR. The most important change was the new rearwheel suspension. Instead of the treacherous swing axles a modern lay out was fitted with two independently sprung half-shafts connected to the differential and with a horizontally sprung bridge connecting both half-shafts over the differential casing. This way track width didn't vary with vertical wheel movement while the suspension was still independent. All this made for far more dependable roadholding and therefore better driveability. In 1961 disk brakes were fitted on all four wheels, replacing the old-fashioned drum brakes, again an improvement for better (and saver) driveability.